The United Nations declared 2010 to be the International Year of Biodiversity. This symbolic gesture invites us to take action as a collective in order to stop the erosion of life on earth. 2010 is an excellent opportunity to celebrate Quebec's biological richness, to uncover its many facets, to unearth some of its secrets and to raise awareness of its fragility. It is thus from a seed of hope that the project TERRA NOSTRA QUEBEC has sprung. TNQ aims at creating a community of eco-citizens committed to showcase Quebec's biodiversity and to promote its conservation. As a first initiative, we conceived an online photo calendar for the year 2010. Each day our website will feature a photo illustrating one of the many aspects of Quebec's biodiversity, be it its wildlife, its flora or its ecosystems. Of course this also includes the humans who live in contact with it - although often contributing to its degradation, and not enough to its protection. Moreover, TERRA NOSTRA QUEBEC invites you to get active and to participate in our photo contest: "BIOdivert yourself in 2010!". The objective is to draw up a portrait of Quebec's biological diversity on 2010 pictures. 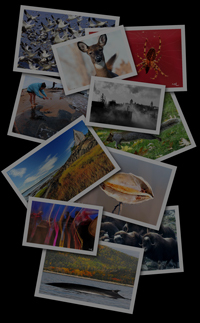 You may get the chance to exhibit one (or several) of your photographs in our virtual gallery which will be revealed on May 22, 2011, the international day of biodiversity. As the founder of TERRA NOSTRA QUEBEC, I hope many of you will rise to the challenge. Let's make a "graphic" statement and leave a legacy for future generations. Send us your shots and don't forget: BIOdivert yourself!